Bumgarner, John R. (1994). The Health of the Presidents: The 41 United States Presidents Through 1993 from a Physician's Point of View. প্ৰকাশক Jefferson, NC: MacFarland & Company. ISBN 0-89950-956-8. Cannon, Lou (2000) . 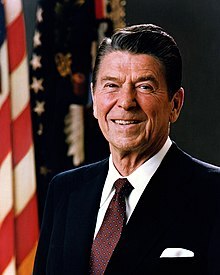 President Reagan: The Role of a Lifetime. প্ৰকাশক New York: PublicAffairs. ISBN 1-891620-91-6. https://books.google.com/books?id=vkUbP1G1hmkC. Pemberton, William E. (1998). Exit With Honor: The Life and Presidency of Ronald Reagan. ISBN 0-7656-0096-X. https://books.google.com/books?id=pvQtMzEa890C. Reeves, Richard (2005). President Reagan: The Triumph of Imagination. প্ৰকাশক New York: Simon & Schuster. ISBN 0-7432-3022-1. Wills, Garry (1987). Reagan's America: Innocents at Home. প্ৰকাশক Garden City, NY: Doubleday. ISBN 0-385-18286-4.